Do you ever just wander around the grocery store until inspiration strikes? Sometimes that means I’m in and out of the store in five minutes, but sometimes it means I’ll wander aimlessly for hours. I find it very zen to walk the grocery store and contemplate what I can make. The choices sometimes overwhelm me but on a recent trip I was in-and-out. 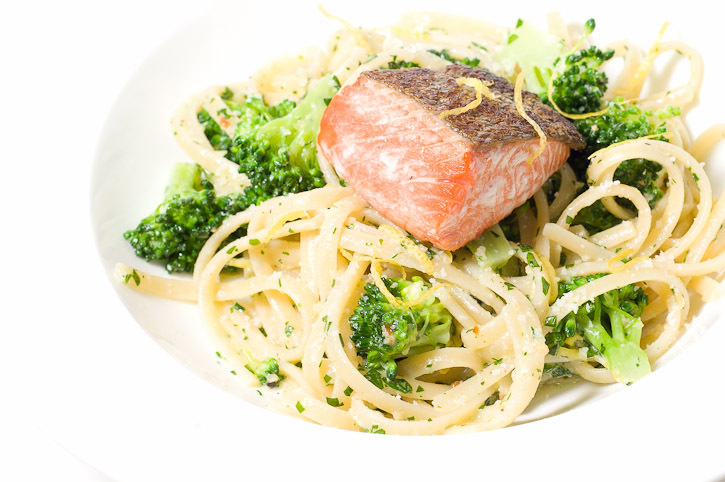 The result: a super-fresh, full of green flavour flat-leaf parsley pesto with broccoli, pasta and salmon. Generally, pesto is made with basil and pine nuts, but it’s not unusual to find it made with other green herbs and nuts as well. I went with flat leaf parsley and pine nuts and it came together super-quickly. I used a mortar and pestle and I really recommend it over a food processor. Crushing everything by hand results in the ingredients being differently sized, which allows you to taste the goodness of the individual components. Pesto is so green it reminds me that spring is on the way. If you’re looking for a dish to brighten up your dreary winter, this is it! 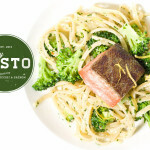 i am salmon, i am pesto-ed: i am parsley pesto pasta with broccoli and salmon! Toast the pine nuts in a dry pan over low heat shaking the pan often. The nuts take on a gorgeous golden brown colour and will start smelling divine within minutes. Keep a close eye on them so they don’t burn. While your pine nuts come down to room temperature, set a pot of salted water on to boil for your pasta and roughly chop the parsley leaves. 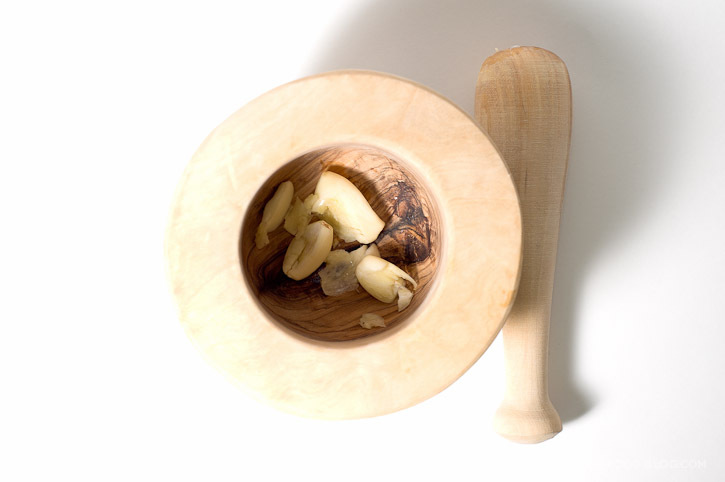 In a mortar and pestle, smash the garlic until smoothish and add the pine nuts. Continue to grind away until everything comes together in a paste. Stir in the oil until well incorporated and add the cheese and parsley. Give it a quick mash and taste, adding lemon juice, zest and salt and pepper as you see fit. Cook your pasta according to the package instructions. While the pasta is cooking, heat up a small amount of olive oil in a frying pan. Raise the heat to medium-high and place the salmon in the pan, skin side down. Cook until the skin is crisp and brown, about 4 minutes. Turn and cook another 3 minutes or so. The salmon should flake easily when it is done. Season with salt and pepper. By now your pasta should be cooked. Drain, but reserve some of the cooking liquid. 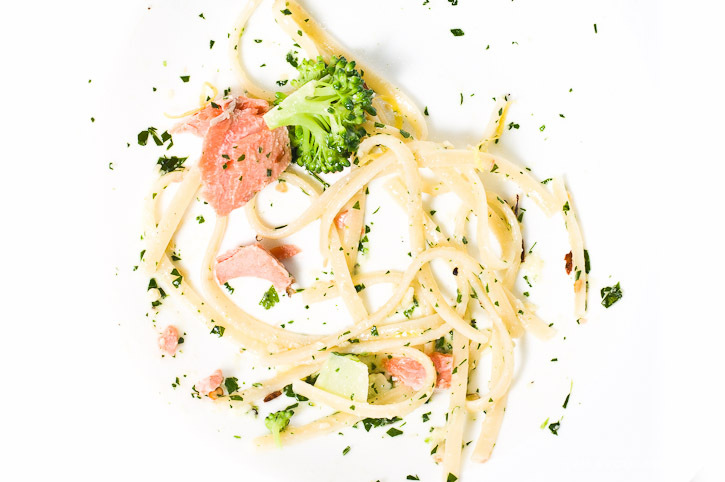 Toss the hot pasta with the cooked broccoli and some pesto. 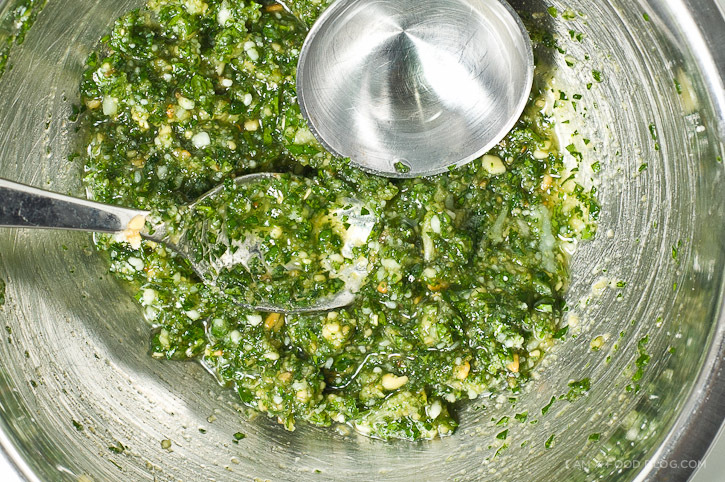 Start by adding 2 tablespoons of pesto and add more as needed. To loosen the sauce a bit, add the reserved pasta water a tablespoon at a time. Mix well and enjoy hot with the salmon filet on top. *Note: this pesto is quite garlicky, which is how we like it, but if you’re not such a garlic fiend, 1 or 2 cloves will be plenty. you have no idea how happy i am that you are updating your blog again!! i lovee your photos, your stories, and your recipes :) keep ’em coming!! Yum this looks so fresh and delicious. I absolutely love your photos! ONE: This is my dinner tomorrow. Absolutely happening. I’ve been in the mood for salmon all day… ant let’s be honest, I’m always in the mood for pasta. TWO: I am in love with your photography and design sense. I will definitely be back! Yum! 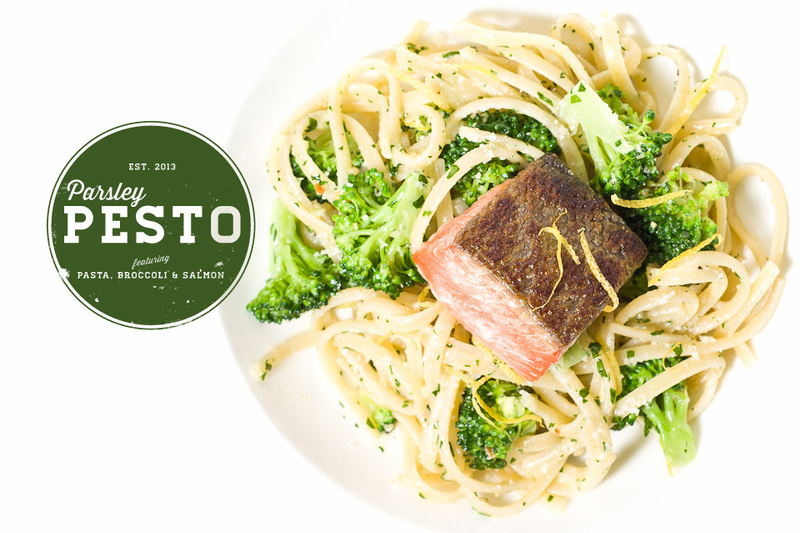 I like the pesto-broccoli idea…thanks for posting! In reality is there any better flavours in life better than pesto?? I love mediterranean recipes that are light & flavorful, I am making this tonight, I am glad I clicked on your blog , oh yeah the photos got me.. I love pesto pasta and this one definitely enticed my taste buds! I would love to try this myself! I tripped onto your blog, awesome! I’m not a cook but I’m going to surprise my family with this meal. Simply love the way this blog and the food looks in it! Plain Awesome!!! Looks delicious! Love the use of olive oil. Can one add homemade olives for more flavour to the dish or would the olive oil from the olives make it to rich or destroy the recipe? Really great recipe, will cook it tonight! Delicious dish! Really love the use of olive oil. Can one add homemade olives to the recipe to add more flavour or would the oil from the olives make the taste to rich because its adding more to the olive oil amount given? So excited to try the recipe, will start cooking tonight!